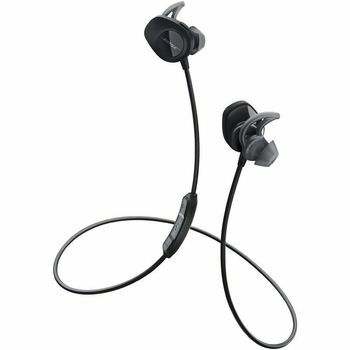 Styled in black these SoundSport Wireless In-Ear Headphones from Bose can pair with up to two devices via Bluetooth, with or without the use of NFC tap technology. They also offer proprietary StayHear+ eartips that conform to your natural ear-shape for a more secure and comfortable fit. These features render them suitable for use during the most vigorous of exercise routines. Bose's volume-optimized EQ ensures that the frequency response of these headphones stays balanced and even at any volume. With a sweat- and water-resistant construction. Get the most out of your headphones. Bose designed this free app that makes connecting and switching between devices easier than ever. It also provides product tips and lets you personalize your settings, so you can make them all yours. See how a simple, intuitive app makes all the difference. Styled in black these SoundSport Wireless In-Ear Headphones from Bose can pair with up to two devices via Bluetooth, with or without the use of NFC tap technology. They also offer proprietary StayHear+ eartips that conform to your natural ear-shape for a more secure and comfortable fit. These features render them suitable for use during the most vigorous of exercise routines. Bose's volume-optimized EQ ensures that the frequency response of these headphones stays balanced and even at any volume. With a sweat- and water-resistant construction. Engineered to push you forward, not hold you back Exercise is a demanding activity. And you demand wireless earbuds that are up to the challenge. SoundSport wireless headphones keep you moving with powerful audio and earbuds that stay secure and comfortable. 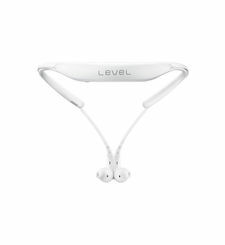 An unmatched combination of comfort and stability When you’re working out, you want your earbuds to stay in. That’s exactly what these do, with a level of comfort that keeps your focus solely on your workout. 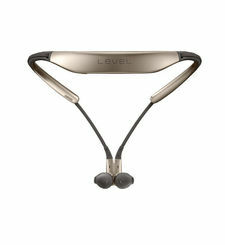 The tips’ unique shape creates a gentle seal in your ear, which helps improve audio performance. The extended flexible wing provides support and improved stability. Bluetooth® and NFC pairing keep you tangle free You want a quick, wireless connection so you can get moving. SoundSport wireless headphones deliver, pairing to your Bluetooth device with ease. 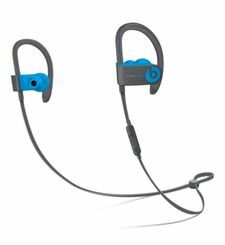 Sweat- and weather-resistant design Sweating it out in the gym or running through the rain, these are sport earphones built to keep you going every step of the way. The acoustic ports are positioned to resist sweat and weather, and a hydrophobic cloth keeps moisture out. An app can make the difference Get the most out of your headphones. Bose designed this free app that makes connecting and switching between devices easier than ever. It also provides product tips and lets you personalize your settings, so you can make them all yours. See how a simple, intuitive app makes all the difference.